Villa Gina is a beautiful restored farmhouse in the countryside. The area is hilly and the villa is a few kilometers from the charming village of San Severino Marche. The villa is elegant and comfortable and furnished with taste and attention to detail. There is a large garden and a wonderfully refreshing swimming pool. The house is surrounded by a lush garden and a nice patio for cozy afternoons in the peaceful countryside. There is a good view of the surrounding countryside. It is an ideal place for a relaxing holiday with your family or friends. 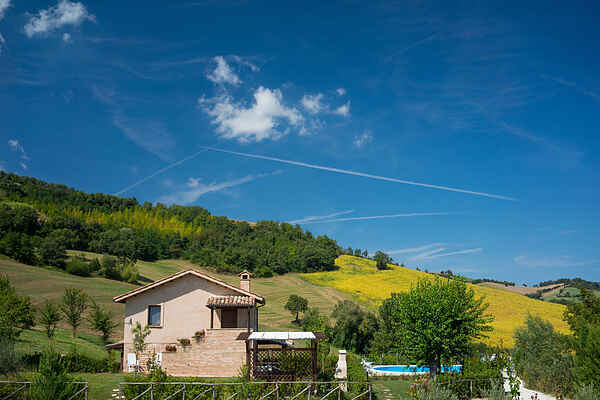 The villa is ideally located to visit the most interesting places of this region including Macerata and Recanati. Macerata is famous for the Sferisterio where operas are performed during the summer.Recanati is the residence of the poet Giacomo Leopardi and is a charming town. In the region of Le Marche organized lots of activities: Carnival in Fano (www.carnevaledifano.com) with floats and folk groups. The parade takes place every year along Viale Gramsci. In the city of Fermo is an annual event of typical local products, including the "oliva all'ascolana", cheese, salami, vin cotto, wines and olive oil. The March (www.tipicita.it). The last Sunday of May, all wineries open. Learn all about wines and taste the wines (www.movimentoturismovino.it). The festival of the Apennines. A festival from May to July in Ascoli Piceno with shows, concerts and cultural activities (www.festivaldellappennino.it). Film festival: Every year in June there is an important film festival in Pesaro (www.pesarofilmfest.it). A music festival in June, more information can be found on the website (www.musicultura.it). Street festival. In the city of Fermo you can see all kinds of spectacles of street artists (late June). Incredibly fun! www.veregrastreet.it/it/il-festival CaterRaduno concerts and live radio broadcasts in late June in Senigallia in the center. www.caterueb.rai.it Want to see how ice cream is made? Then have a look at the ice festival in early June in Agugliano (www.gelatoartigianalefestival.it). In the town of Macerata each year in July and August an opera festival. (www.sferisterio.it). You can see the operas Rigoletto and La Boheme. Very worth it !! Futura Festival in Macerata in July and August. (www.futurafestival.it) with concerts and shows. In July and August there is a dance festival in Macerata Civitanova Danza. Mordern dance. The event takes place in three theaters. www.civitanovadanza.it Verdicchio in festa is a wine festival in Montecarotta in July. Verdicchio is one of the most famous wines of the region. Do you like ham? Visit the Ham Festival in July in Carpegna. It is the feast of prosciutto crudo. In August you can go to the Rossini Opera Festival (www.rossinioperafestival.it). Beautiful and special! In the town of Senigallia every year in early August a festival of American music: www.summerjamboree.com Rock'n roll, jive, blues and much more! Sagra or Vernaccia, a local party with good food and good wine. www.comune.serrapetrona.mc.it Rosso Conero Festival: in September a festival to promote the red wine of the Conero area Camerano. www.turismocamerano.it Festa dell'Uva: a wine festival in Arcevia. Taste delicious wines! www.arceviaweb.it Pane Nostrum is an event in Senegallia where you can see how traditional bread is baked. www.panenostrum.com The festival of the white truffle in San'Angelo Vado (www.mostratartufo.it). On the weekends of October and November.